New in OctoMY™ HQ is a test-rig of sorts. On the wall hangs 3 separate touch-enabled PCs, each with an embedded variant of Debian and a script to auto-load latest build of remote, agent and hub respectively. 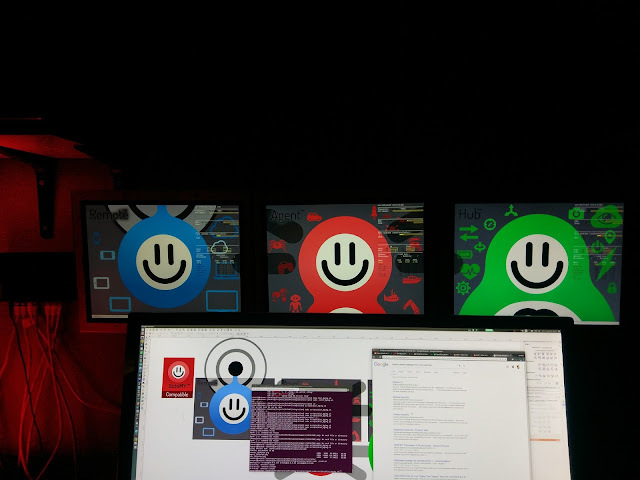 Of course each computer has the smiling mascots as wall papers to provide comfort and inspiration whenever the respective programs are not running (usually due to bugs). This system will in addition to the build in TravisCI hopefully allow for much shorter debug cycles. If you havent already noticed, there is a new kid on the block. You can read all about him here. We look forward to supporting your hardware. Hugs from the OctoMY™ robot platform! Today I learned a cool thing about soldering. Solder is usually 60% Tin, 40% Lead, and this is referred to as 60-40. When the solder joint cools, the different metals will solidify at different times, and there is a short time when one metal is solid while the other is liquid, called the "plastic phase". Unless the solder joint is kept absolutely still you risk creating artifacts in the joint such as voids and cracks that will decrease the quality of the joint considerably. The solution is to switch up the numbers. You can find solder with the perfect balance of 63% Tin to 37% Lead which completely removes this problem. So now you know what solder to get next time! I came across this excellent series of videos on the subject of building your own LiPo battery. It was made with electric bikes in mind, but the information is equally useful from the perspective of someone making batteries for any other application, such as robotics. I decided to share the playlist containing 5 parts here. Part 1: Battery layout, serial vs. parallel etc. Part 2: Welding batteries together using special purpose spot welder and nickel strips. Part 3: Choosing and installing a BMS (Battery Management System). Part 4: Sealing the battery with shrink wrap tube, kapton tape and foam. Part 5: Choosing an appropriate charger. And finally, a web-shop that supplies the best 18650 cells (Panasonic 18650GA).